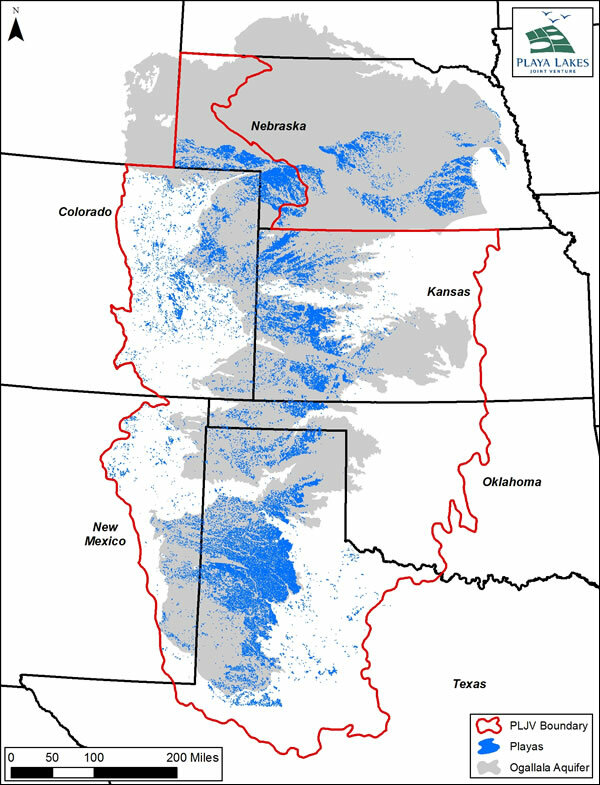 More than 80,000 playas overlay and, when healthy, recharge the Ogallala Aquifer. Click to enlarge. As communities struggle to deal with drought and declining aquifers, playas—a major yet relatively unknown natural resource—are playing a role in replenishing and improving the quality of the region’s water supply. Playas are the most numerous wetlands in the region, with more than 80,000 scattered across the western Great Plains. Properly functioning playas have intact clay basins, are encompassed by grassy buffer strips or prairie, and collect runoff from the surrounding area after large rain events. 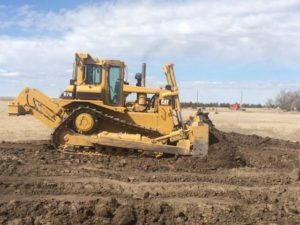 Research has shown that these shallow, temporary wetlands are a primary source of recharge for the Ogallala Aquifer, contributing up to 95 percent of inflow of water to the aquifer and improving the quality of that water. Recharge rates in playa basins are 10 to 100 times higher than under other areas, and groundwater recharge may exceed three inches per year in unaltered playas. This recharge through playas is a continuous process. In fact, water reaching the aquifer today started its journey during our parents and grandparents lifetimes; and the water recharging now will be available for today’s children and future generations. 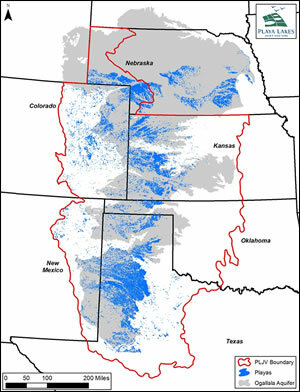 Aquifer recharge occurs through playa basins and along the perimeter of playas. When a dry playa receives a surge of water from rainfall, water flows into the playa basin and moves through the clay layer via large cracks. These cracks eventually swell shut as the clay absorbs water making the basin impermeable. Recharge continues to occur along the playa’s perimeters as long as it is submerged in water, much like water running over a bowl’s lip. Healthy, functioning playas are areas of focused recharge and improve the quality of water flowing into the Ogallala Aquifer. Research shows that water reaching the aquifer through playas is of higher quality than that going through other pathways. This happens in two ways: first, as rainfall and runoff travel toward the playa, the surrounding grasses trap sediments, which can carry contaminants into the playa; then, as the water moves through the clay floor of the playa, a second ‘cleaning’ process occurs as the soils beneath the playa remove nitrates and other dissolved contaminants. Filling a pit in a playa. Playas work best when they are surrounded by a native grass buffer that filters out soil and agricultural contaminants and there are no pits or other modifications to the playa. Filling in pits is one of the easiest ways to restore a playa. In most cases, the spoil pile from the original excavation is present and used to refill the pit. Once filled, rainwater and runoff can reach the large cracks in a dry playa—which is essential for recharge to occur—rather than collecting in the pit. The shallow water that spreads across the playa also allows plants to flourish, which in turn provides important food and habitat for migrating birds and other wildlife. USDA Farm Bill programs are available to help landowners restore and conserve playas. Contact your local Natural Resources Conservation Service Center for more information.